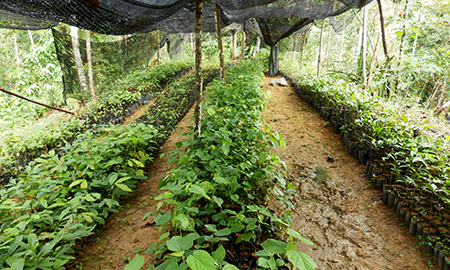 Rainforest Rescue’s plant nursery propagates and grows all the rainforest trees for our Daintree lowland revegetation projects. The rainforest trees are used for our Plant a Rainforest Project and to support the efforts of other landholders in the Daintree. All of the seeds are collected from the Daintree Lowland Rainforest between the Daintree River and Cape Tribulation and the trees are replanted in this area. With the support of a committed group of volunteers the Nursery produces, on average, 20,000 plants per year. The Nursery is located in the Daintree National Park on land owned by the Queensland Department of Environment and Natural Resources. It is managed by Rainforest Rescue’s Nursery Manager who is responsible for seed collection, species selection, propagation and growing of trees required for our revegetation projects. If you wish to access trees for revegetation projects or if you have any other enquiries please email us. Prior to 2010 the Nursery was managed for many years by the Daintree Cassowary Care Group – a volunteer-managed community organisation. We thank them for the faith shown in Rainforest Rescue in continuing their good work and for the gift of the nursery infrastructure and materials.